I can’t help but think that Martin Luther King, Jr. would not be very happy with us today. After all, so many of the principles that were dear to him and gave his life purpose are not held with the same regard that they were when he was enlightening a divided culture. He taught, for example, “All labor that uplifts humanity has dignity and importance and should be undertaken with painstaking excellence.” He wasn’t all that keen on welfare programs, and yielding our personal responsibility and accountability to the state. I think he would be supportive of the peaceful and principled “Tea Party” revolts against a government seeking to diminish individual liberty and exact oppressive taxation on the productive members of society. As he said, “Freedom is never voluntarily given by the oppressor; it must be demanded by the oppressed.” Certainly those are wise words of encouragement to those of us who object to the direction the country is headed now. As further evidence of his support for the “Tea Party” cause, he once said, “Change does not roll in on the wheels of inevitability, but comes through continuous struggle. And so we must straighten our backs and work for our freedom.” Individual and universal freedom was everything to him, without regard to ethnicity, and advocated freedom, as opposed to government programs that diminish the freedom to build, achieve, be rewarded for those achievements, and succeed. I think Martin Luther King would have concurred with Morgan Freeman a few years ago in a “60 Minutes” interview with Mike Wallace. 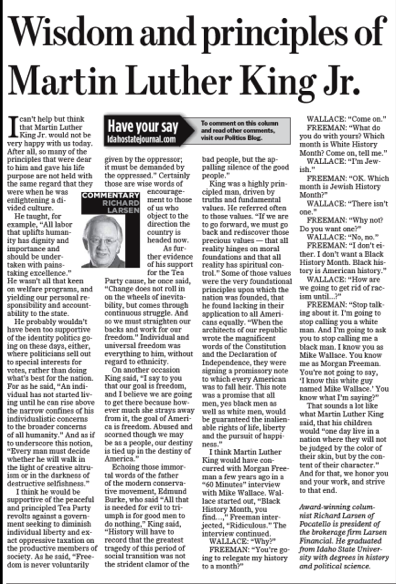 Wallace started out, “Black History Month, you find…”, Freeman interjected, “Ridiculous.” The interview continued. That sounds a lot like what Martin Luther King said, that his children would “one day live in a nation where they will not be judged by the color of their skin, but by the content of their character.” And for that, we honor you and your work, and strive to that end.